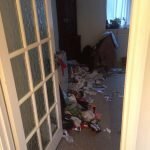 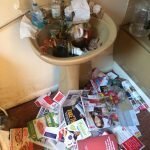 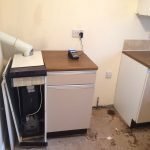 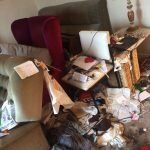 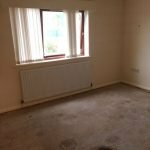 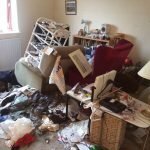 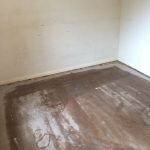 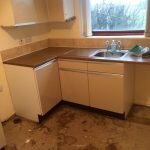 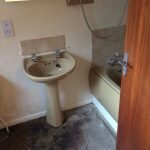 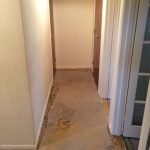 House Clearance Service In Adwick-le-Street Carcroft Highfields Skellow Woodlands. 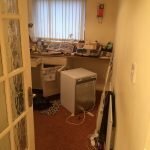 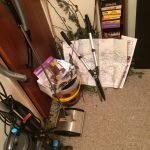 As well as clearing the usual furniture these small items will also need clearing – A Dewalt DCS355 B N XR brushless oscillating multi tool 18-20 volt, a set of eight red ceramic napkin rings, A Phillips E27 white and colour ambience light bulb starter set, A brand new Sass and Belle pink flamingo 3D china mug, A John Lewis terracotta snack, olive and dip serving bowl set with tray, A vintage set of Pifco nursery rhyme fairy lights, A Phillips Hue bridge wireless lighting hub. 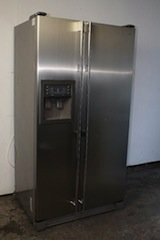 A stainless steel Samsung American style fridge freezer, with built in water and ice dispenser to the left door. 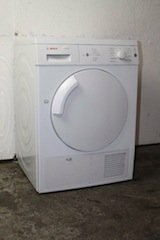 A white LG 6kg under counter washing machine. 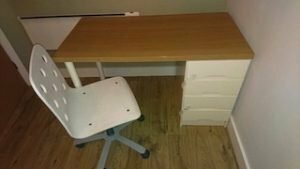 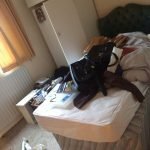 An Ikea three drawer desk, together with a swivel white desk chair. 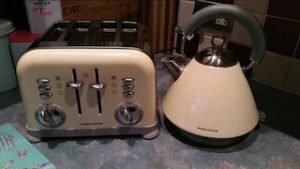 A cream retro style Morphy Richards cone shaped kettle, together with the matching four slice toaster. 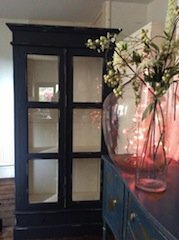 A tall standing solid wood and glass inlaid display cabinet. 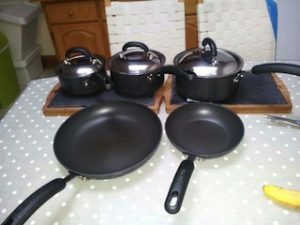 A black five piece pan set, includes two frying pans and three lidded sauce pans. 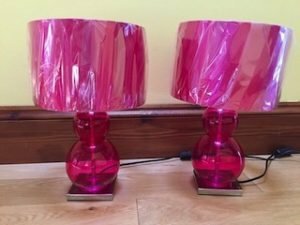 A pair of brand new hot pink glass table lamps with pink shades. 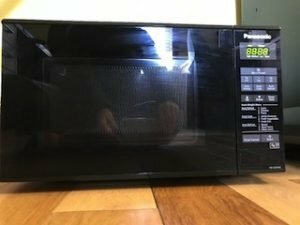 A black Panasonic 600w microwave oven with LED display. 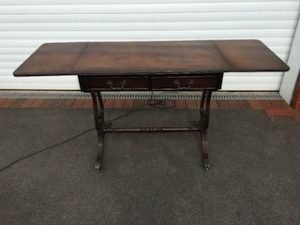 A vintage solid oak drop leaf occasional table. 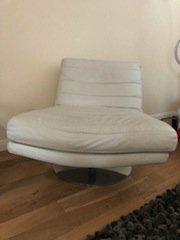 A modern Contemporary Italian lounge chair on a chrome circular base, upholstered in white authentic leather. 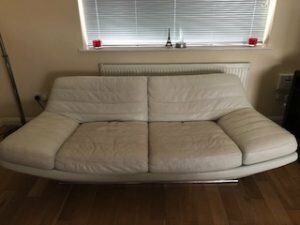 A small two seater low back contemporary Italian sofa, upholstered in white authentic leather. 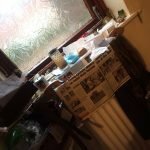 A pair of shabby chic solid wood painted dining chairs, upholstered to the seats with stag patterned fabric. 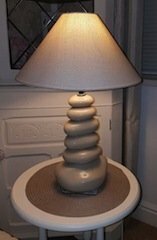 A unique modern stone ceramic table lamp with grey shade. 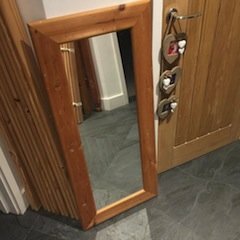 A small slim solid pine framed wall mountable mirror.